Working on the roof of your home can be very dangerous. Whether you have a roof with a steep slope or a relatively flat roof, there are a number of things that can go wrong when you’re up that high. You could potentially injure yourself or others if you aren’t careful. Let’s take a look at some steps you should take to stay as safe as possible. Stay off your roof if it’s wet. When your roof is wet, it can be very slippery and difficult to navigate. Therefore, you should never attempt to do any work on a roof if it has rained or snowed recently. You should also clear a roof of leaves and other debris before working on it since they can also lead to slippery conditions. Avoid working on your roof when it’s extremely hot or cold. Outside of the fact that very hot or cold temperatures can make it unbearable on a roof, extreme weather can also impact any repairs that you make on it. For example, if you attempt to put down new shingles or seal your roof when it’s too hot or cold, the job probably won’t get done right. The hot or cold will prevent seals from setting and could do damage to shingles. You would be surprised by how many people attempt to work on a roof while wearing average sneakers or even open-toed shoes. When you are working on a roof, you want to wear shoes that will provide you with good traction so that you don’t slip and fall. Hire a professional if you aren’t sure what you’re doing. The roof on your home is one of the most important parts of it. Therefore, if you find that you aren’t 100 percent sure what you’re doing when you’re on your roof, stop and call for help. A professional roofer will be able to inspect, repair, or replace a roof for you in the safest manner possible. 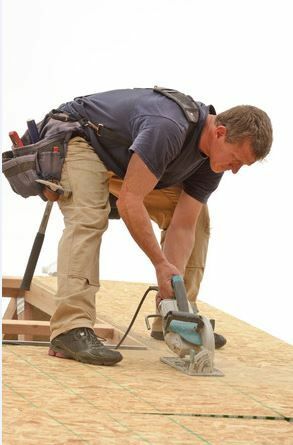 At Roofing by Bruce, we understand how important it is to be safe when working on a roof. We can come to your home and work on it while keeping safety in mind. Call us at 570-424-7250 to speak with us about the roofing services we offer.